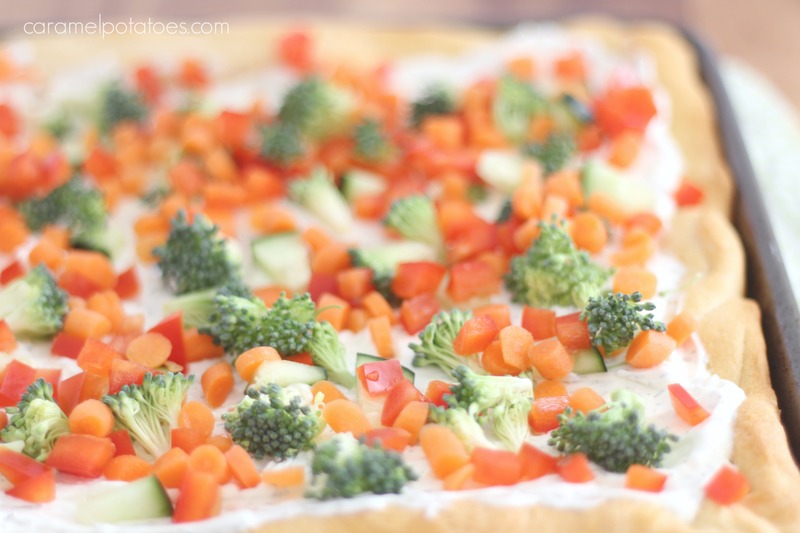 This Veggie Pizza Appetizer is another oldie that I just love to find on a party spread. 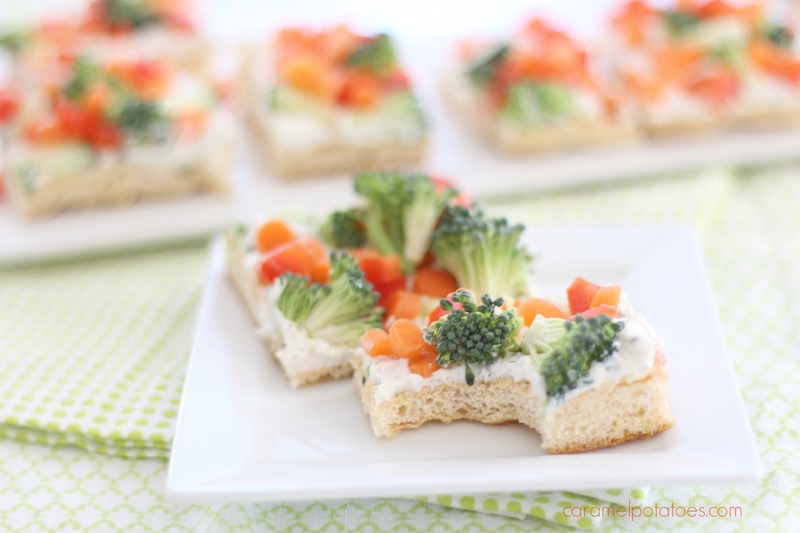 It’s easy to make with refrigerated crescent dough topped with seasoned cream cheese and fresh veggies. The fun part is you can customize this to your own individual taste. 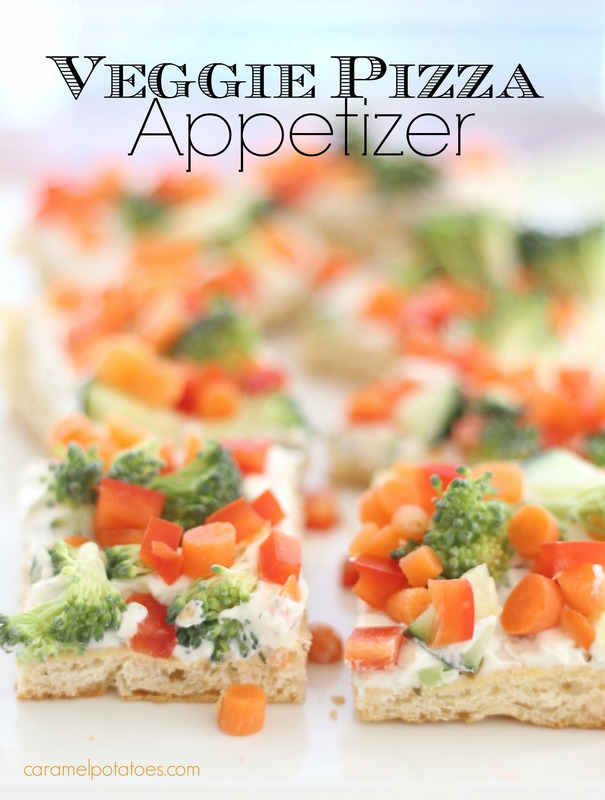 I used broccoli, cucumbers, peppers, and carrots, but there is no limit to the crunchy combinations you can make. I’ve seen tomatoes, onions, olives, and even cheese added to the mix. 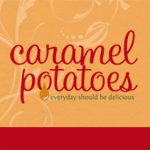 I love the fresh flavors and crunch of the veggies – it’s like carrying a salad in your hand. So if you are looking to add a little freshness to your game-day nosh or celebrating with friends, this recipe is tried, true and so delicious. Unroll the crescent rolls and press into the bottom and up the sides of a 15x10x1-inch pan making sure to seal any seams. Bake until golden brown, 11 to 13 minutes. Place the pan on a wire rack to cool completely (about 30 minutes). In a small bowl, mix the cream cheese, sour cream, dill, chives, onion powder, and garlic powder until smooth. Spread in an even layer over the cooled crust. Top with veggies and serve immediately or refrigerate until ready to serve. NOTES: *If you can’t find the crescent dough sheets you can use the crescent roll dough, being careful to seal all the seams. Light cream cheese and light sour cream may be substituted. Use a variety of veggies and even cheese to customize this to your taste.